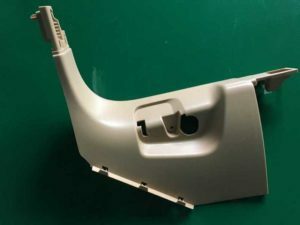 The use of laser machining for making plastic injection mould has been available for years, but has only received limited acceptance. This is partly due to the uncertainty of the new technology and the cost of the machines. However, for the right application, laser machining is a very viable option. With the latest generation of precision laser cutting machines, there are many improvements. Cutting speeds have increased, accuracy has improved, surface finishes are better, and the cost has come down. How can laser machining help a plastic mold maker? Precision laser cutting is an ideal operation for engraving and the machining of very intricate, small, shallow cavities. One of the benefits of laser machining is that it can engrave on complicated contours very consistently and with a high degree of accuracy. It is also possible to use laser machining services to engrave molds with changing vertical wall angles. Laser micro machining can produce small, intricate and precise cores and cavities as well. Because the geometry is produced directly from the CAD file, the laser machining operation can faithfully reproduce the designed shape. A precision laser cutting machine can cut within microns. The newer machines are also 5 axis and able to machine a wide range of angles and shapes. The XYZ positioning accuracy can easily rival that of a high quality CNC machining center. Are laser engraving machines safe? While it might sound dangerous, a precision laser cutting machine is actually quite safe. Of course, somebody might be tempted to ignore common sense and stare at the laser beam with their naked eye, but even this is not so easily done. Generally, however, the machine just hums away, doing its required task. Are lasers fast enough to compete? Depending on the application, a laser machining tool is financially justifiable. The applications are limited to shallow details, which eliminates many projects. However, if your need is for intricate, shallow details, precision laser machining could be the answer. Because the entire process is computerized and automatic, it readily lends itself to small scale production. The engraving of logos is a great example. If your logo is to be cut into a contoured surface, it may not be possible to CNC machine it, or even EDM it. This is where laser machining can be a viable option.